When we started this project, we never imagined it would grow to become what it is today. Even before he got the idea for rainworks, Peregrine had a fondness for creating novel art. This 'sun'-activated art' was created using the reflections of little mirrors. 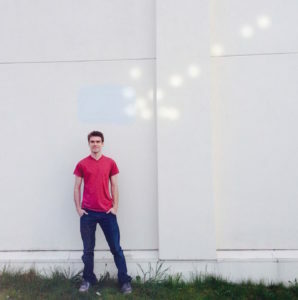 In 2013, 20-year-old creator of novelty Peregrine Church learned about super-hydrophobic coatings from a video online, and he began to brainstorm creative uses for the material. Since super-hydrophobic coatings repel water and keep surfaces dry, and since concrete changes color in the rain, Peregrine thought he might be able to use the super-hydrophobic coating to create hidden messages that only appear on rainy days. He presented his idea to local organization The Awesome Foundation, who awarded him a $1,000 grant to begin experimenting his concept. Peregrine used the grant money to purchase a variety of super-hydrophobic coatings and began to make small tests near his home. At first, he ran into some problems. While the concept proved promising, all of the early tests had one thing in common: They were not invisible on dry concrete. All of the products Peregrine attempted to use in his early tests (such as NeverWet, Hydrobead) had a whitish/bluish haze that could be seen when the concrete was dry, which kind of ruined the magic. The entire point was to make invisible messages that appear on rainy days! Despite his disappointment with the lack of invisibility, Peregrine shared a video of one of the early tests onto a comment thread on reddit. That reddit post was seen by a chemical manufacturer in Belgium, who contacted Peregrine and said, "we think we can help." The manufacturer offered to work with Peregrine to develop a new super-hydrophobic coating, specifically for making rainworks, which would actually be invisible on dry concrete. They sent Peregrine a sample, and in May 2014 he used that sample to create, what we now consider to be, the first real rainwork: STAY DRY OUT THERE. To Peregrine's delight, the formula was, in fact, totally invisible when it was dry - you couldn't see it, feel it, smell it - it really was like magic. 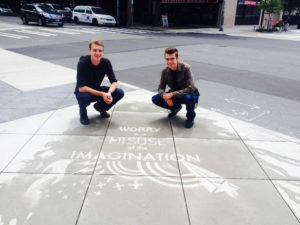 With help from his best friend, Xack Fischer, Peregrine began decorating the streets of Seattle with rainy-day art. The goal: to give people a reason to smile on rainy days. They spent the next 10 months sneaking around the city in the middle of the night, trying not to be seen, as they created their secret messages. It was during this time that Peregrine coined the term 'rainwork' (a combination of rain + artwork) as a simple way to refer to this new medium. This was when Peregrine & Xack first launched www.rain.works, and with it, the official rainworks map -- as a quick reference that explained what rainworks were, and where they could be found. 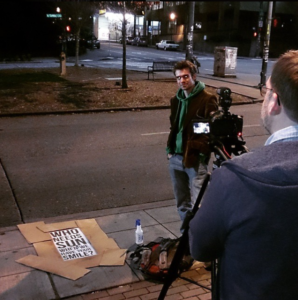 In early 2015, Peregrine and Xack were approached by Waka Waka Studios, a film production duo who had heard about rainworks from a mutual friend and were interested in making a video about the project. They shot some footage of Peregrine making rainworks, edited it together, and posted it online. The next few weeks were an absolute frenzy, as the world discovered rainworks. The video that Waka Waka made went viral, netting over 18 million views between YouTube and Facebook and gaining worldwide attention. Click here to view a complete list of rainworks appearances in media & pop culture. As a result of the viral video, Peregrine began receiving a flood of emails from people who wanted to make their own rainworks. 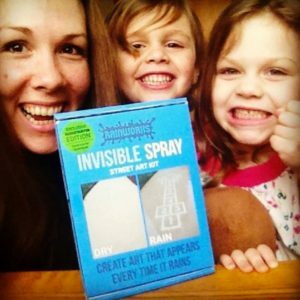 As a response to all of the enthusiasm, Peregrine and Xack launched a Kickstarter campaign to turn their special formula into a product and spread rainworks across the globe. In September 2015, with help from 690 awesome backers, they successfully reached their funding goal. 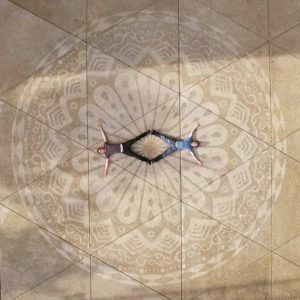 As a result, in March 2016, the product was launched, Invisible Spray became available to creative people all over the world, and we began accepting map submissions from anybody who wanted to share. Since we unleashed our formula onto the world, new rainworks have been popping up like crazy! Anybody can visit our official tutorial page to learn how to make their own rainworks. We've shared all of our tips & tricks from our years of experience so that you can avoid making the mistakes we made while we were learning. The Official Rainworks Map now has over 200 rainworks, from dozens of contributors, spanning over 5 continents. Anybody who makes a rainwork can add its location to the map! 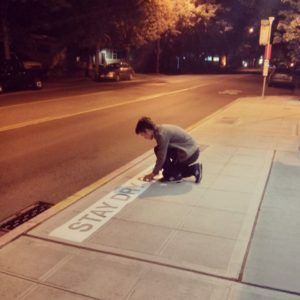 In 2018, we launched a mobile app that makes it easier than ever for people to find rainworks near them, and share rainworks they've made. Nearly every day, people are sharing photos of new rainworks they've made with the official hashtag: #Rainworks. It's thrilling to see creative people giving their communities a reason to smile on rainy days!